The air is hot and dry, and the red sand countryside, with the exception of some rounded rocky outcrops scattered across the plain, is flat and desolate with plenty of wide open space. An eagle soars silently overhead. In fact, out here the silence is almost deafening in this remote corner of the WA outback. The area, until recently, saw very few visitors, but all this is beginning to change and part of the main reason it seems is because word is spreading of a mysterious painting of an old sailing ship on a rock face some 300 kilometres inland from the West Australian coast. The Dreamtime art site where this painting has been found is at Walga Rock, located some 47 kilometres west of Cue in the Murchison Goldfields. 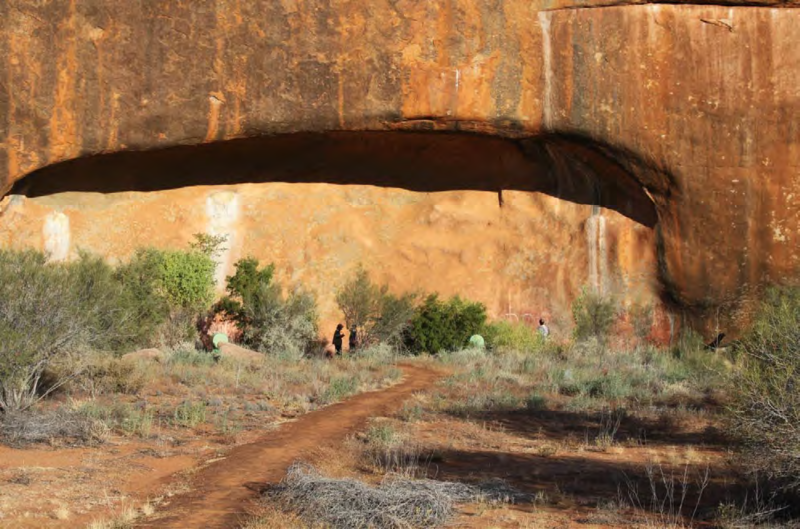 There is one main gallery at Walga known to the local Aborigines as Wolgarna Rock or Walganna Rock and several other lesser-known art areas scattered around the two kilometre long monolith. The whole area here continues to have cultural and spiritual significance to the local Aboriginal people, now mostly based in Cue. 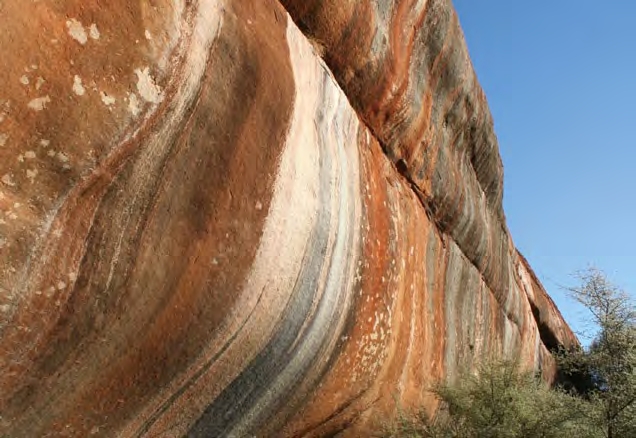 The Walga Gallery, dated with radio carbon tests by archaeologists to around 10,000 years old, has extensive paintings of snakes, emus, kangaroos, footprints, boomerangs and hand motifs. Some of the deep red ochre colours used in the paintings come from the huge Wilgie Mia ochre mine, located away to the north, whilst the white clay tones come from clay dug from nearby breakaways. Both finger painting, as well as ‘paint’ applied with the flattened end of a twig (an aboriginal bush paint brush), have been used at this quite extensive art site. Clearly though, the most fascinating aspect to most historians, researchers and rock visitors, is the intriguing painting in white ochre of a sailing ship, complete with masts, rigging and portholes, located about two metres high at the northeastern end of the main gallery. It has all of the experts puzzled and curious. After some years of investigation and discussion, debate rages today stronger than ever, on not only who would have been responsible for this quite outstanding painting, but why it was done, how long ago, exactly what type of ship is depicted, and there is even mystery and conjecture about the strange Arabic style writing underneath it. As the controversy continues, it emerges that there are now four main theories to explain the presence of the drawing which appears to most to be of an old square rigged sailing ship with seven square port holes, and what seems to be six lines of ‘writing’ underneath. The first belief is that it was actually painted by a survivor or a descendant of a survivor, of one of Western Australia’s many shipwrecks, especially the many Dutch vessels which came to grief along the treacherous central coastline of WA. More particularly, could it have involved one of the two young men, Jan Pelgrom or Wouter Looes, both aged 18 at the time, who had been cast ashore to fend for themselves by the skipper of the Batavia for their part in the bloody mutiny which took place when she ran aground on reef in 1629 not far from where Kalbarri is now located? Or perhaps it could have been the skipper of the Sardam, which came to rescue the Batavia survivors. He was known to have taken the ship’s long boat for a short exploration of the coast and Murchison River, and never returned. A second theory, a classic tale, has the painting being done by a part Aboriginal girl with white hair and blue eyes. She is said to have been killed by local Aborigines shortly afterwards, reportedly because she had violated the sacred site which was restricted to initiated men. There have been no human remains found nearby, nor has there been any other firm evidence found of such an incident taking place. Experts think this one is probably just a popular myth, yet the story persists! A third theory suggests that it is the work of an Aborigine who saw an old square rigger in Geraldton Harbour, or off the coast, sometime last century, or, perhaps a lot longer ago, an earlier Aborigine had witnessed one of the shipwrecks during the 17th or 18th century. Both the Batavia and the Zuytdorp came to grief in the 1600s. Yet another account of the painting’s origin relates to an early Afghan trader passing through the countryside during the Murchison gold rush late last century. As there is no known evidence anywhere of its origin, exact dating has proved difficult and there are no Dreamtime stories regarding the scene, each theory continues to create debate and conjecture. 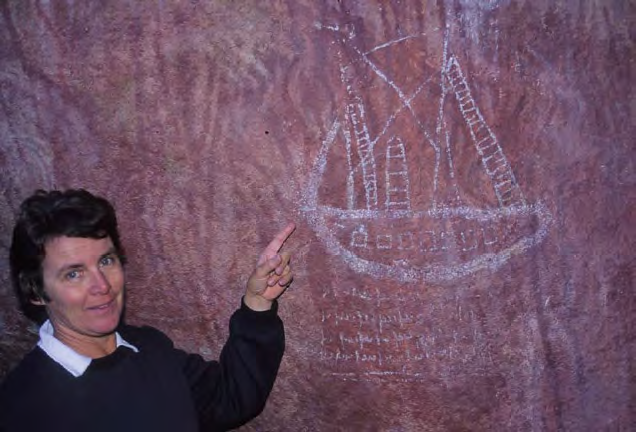 Archaeologists who have visited the site have so far been unable to conclusively prove or disprove any of these possibilities although the sighting by an Aborigine of a 19th century ship along the Geraldton coastline in the 1860s or 1870s is slightly favoured. How would an Aborigine of the day, however, have known about the shape of the keel of a boat which would not be seen below the waterline? Cue locals seem to favour the shipwrecked sailor account, a truly remarkable possibility some 300 kilometres inland from the coast. Experts are also divided on the ship itself, it seems that it could have a smokestack of some sort. Is it a 19th century sailing vessel, a square rig western ship, or a brig, or does it date back to the Dutch explorers, or could it even be a whaler? The mystery continues. Cue locals report that the WA Museum has even been involved in trying to sort out the lines of ‘writing’ or figures drawn in rows underneath the mysterious sailing ship. They apparently suspected that it may have been Sanskrit writing and sent off photos of the artwork to scholars in India. Reports back, however, are that they have apparently been unable to make any sense of it. The most recent theory on this aspect of the painting is that the lines might be nothing more than the artist depicting waves underneath the vessel. Or is this answer just too simple? Perhaps one day, Cue, and the rest of Australia, will know the answers to the many questions about Walga’s mysterious ship. When you are next travelling through WA’s Murchison Goldfields, call into Walga Rock and see what you think. Local Cue residents are amazed at the continual interest in the Walga art site, particularly their increasingly famous mystery ship, it’s controversial past, and the stream of experts and interested researchers each coming away with their own version and theory. The Walga art site can be reached by a dusty, in some sections quite corrugated, gravel track from Yalgoo, approximately 160 kilometres to the south-west, or by a partly sealed (11 kilometres) and reasonable gravel road 47 kilometres west of Cue. There are no real camping facilities available at Walga Rock, although there is plenty of open space nearby which is quite suitable for bush camping. Visitors here should bring all their own water and supplies. A climb to the top is quite rewarding with extensive views over the surrounding countryside and after rain, the sight of many shallow rock pools. One of the easiest access points to the top is located around 300 metres to the left of the art site where there is a relatively gentle slope leading to the summit. 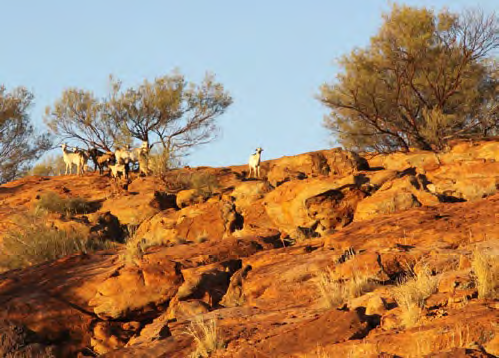 In the area here, look out for a resident herd of wild goats which are often seen browsing on the foliage which grows in crevices and depressions in the rock surface. For photographers, the vivid colours of the rock are particularly appealing in the early morning and late afternoon light. An unmaintained four kilometre drive track (which tends to get a little washed out in some sections after rain) circumnavigates this fascinating natural wonder and provides great views of the granite outcrop including a number of large balancing rocks seen high up on its rust coloured slopes. Nearest supplies, including fuel, water, a small general store, as well as post office, police station, tourist centre, nursing post and caravan park and hotel accommodation, are located at Cue, 47 kilometres from Walga Rock. 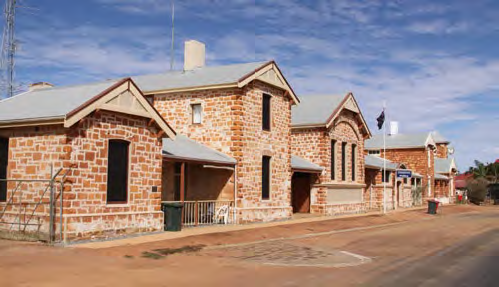 The small township of Cue (population approximately 300) on the Great Northern Highway, lovingly still known as Queen of the Murchison, is a delightfully historic centre with quite a number of century old buildings and structures restored and preserved to give the township real character and appeal. Gold was first found here on 1 January 1892 by Mick Fitzgerald and his partner (who registered the claim over the area) Tom Cue, after whom the town was named. There are several large gold mining operations located nearby. The ruins of the old gold mining town of Big Bell are located nine kilometres off the Cue-Walga Rock access road and are well worth a visit. Except after rain, the road from Cue is suitable (but quite dusty) for conventional vehicles, campervans, motorhomes and sturdily built caravans and camper trailers if taken with care. A visit to Walga Rock and Big Bell can (if preferred) be easily handled in a day visit from Cue. Cue Caravan Park in Austin Street, Cue, has both caravan and tent sites - phone 08 9963 1107. Yalgoo Caravan Park, located in Stanley Street, Yalgoo, also has caravan and tent accommodation - phone 08 9962 8042. Other enquiries phone Cue Tourist Centre 08 9963 1216. Mud maps of the town and local places of interest are also available.